As vote tallies trickle in, Suu Kyi’s NLD looks set to take control and form the government, a triumph that will reshape the political landscape. RANGOON / MANDALAY — Burma democracy champion Aung San Suu Kyi made it clear on Tuesday she was ready to defy attempts by the country’s powerful military to clip her wings, as fresh results from Sunday’s historic election showed her party heading for a resounding win. Under the constitution drawn up by Burma’s former junta, Suu Kyi is barred by the constitution from taking the presidency because her children are foreign nationals, a clause few doubt was inserted specifically to rule her out. But in two interviews on Tuesday, the Nobel peace laureate said that regardless of who was appointed president by the newly elected houses of Parliament, she would call the shots. The ruling Union Solidarity and Development Party (USDP), which was created by the junta and is led by retired soldiers, has conceded defeat in a poll that was a milestone on Burma’s rocky path from dictatorship to democracy. The NLD said its tally of results posted at polling stations showed it was on track to take more than two-thirds of seats that were contested in parliament, enough to form Burma’s first democratically elected government since the early 1960s. The party would win more than 250 of the 330 seats not occupied by the military in the lower house of parliament, NLD spokesman Win Htein predicted on Tuesday. Under the junta-crafted constitution, a quarter of the seats are unelected and reserved for the armed forces. Reuters was not able to independently verify the party’s estimates of its own performance. The election commission said the NLD had won 78 of the 88 seats declared so far for the 440-strong lower house. The USDP had won five. 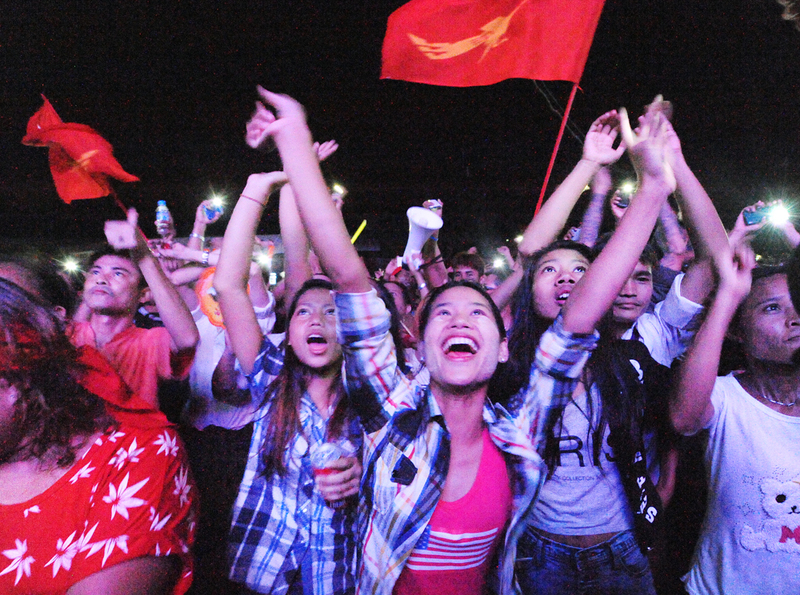 NLD supporters gather at the party headquarters in Rangoon on Nov. 9, as initial election results begin to confirm an anticipated landslide win. In the first upper house results declared on Tuesday, the NLD won 29 of 33 seats and the USDP two. Results for the regional assemblies also showed the NLD well ahead. In addition to his bloc of Parliament seats, the commander-in-chief nominates the heads of three powerful and big-budget ministries—interior, defense and border security—and the Constitution gives him the right to take over the government under certain circumstances. The military has said it will accept the outcome of the vote, and Suu Kyi said times have changed since the 1990 election she won in a landslide that the military ignored. She spent years under house arrest following that poll. “I find that the people are far more politicized now than they were… so it’s much more difficult for those who wish to engage in irregularities to get away with it,” she told the BBC. Still, analysts say a period of uncertainty may be looming for f Burma because it is not clear if Suu Kyi and the generals will be able to share power easily. Sunday’s vote was Burma’s first general election since the military ceded power to a quasi-civilian government in 2011, ushering in reforms and opening up to foreign investors. Money from abroad flowed in quickly as sanctions were eased. Foreign direct investment stood at US$8 billion in fiscal 2014/15, more than five times the flows recorded just two years earlier. Religious tension, fanned by Buddhist nationalists whose actions have intimidated Burma’s Muslim minority, marred the election campaign. Among those excluded from voting were around a million Rohingya Muslims who are effectively stateless in their own land. Suu Kyi, who has been criticized for saying little in defense of the Rohingya, said she would “protect everybody” in the country. It would be difficult to eradicate prejudice, but people “do not want to live on a diet of hatred and fear,” she told the BBC. Washington welcomed the election as a victory for Burma’s people, but said it would watch for the democratic process to move forward before making any adjustments to remaining US sanctions on a country long considered a pariah. A spokesman for the US State Department, Mark Toner, told a news briefing on Tuesday that early results “seem to indicate a landslide” for Suu Kyi’s party, but the slow vote count meant it was too early to determine this for sure. Final results are due no later than two weeks after Sunday’s poll. President Barack Obama has invested significant personal effort in Burma, visiting the country twice in the past three years, hoping to make its democratic transition a legacy of his presidency and an element of his strategic “pivot” to Asia. Top Photo - ( Reuters ) Burmese nationals living in Thailand hold portraits of pro-democracy icon Aung San Suu Kyi and shout slogans during a protest outside the Burmese Embassy in Bangkok May 31, 2009.